The intermediate cuneiform joins by short synovial joints with the medial as well as lateral cuneiforms, and also is connected to them by strong interosseous ligaments. 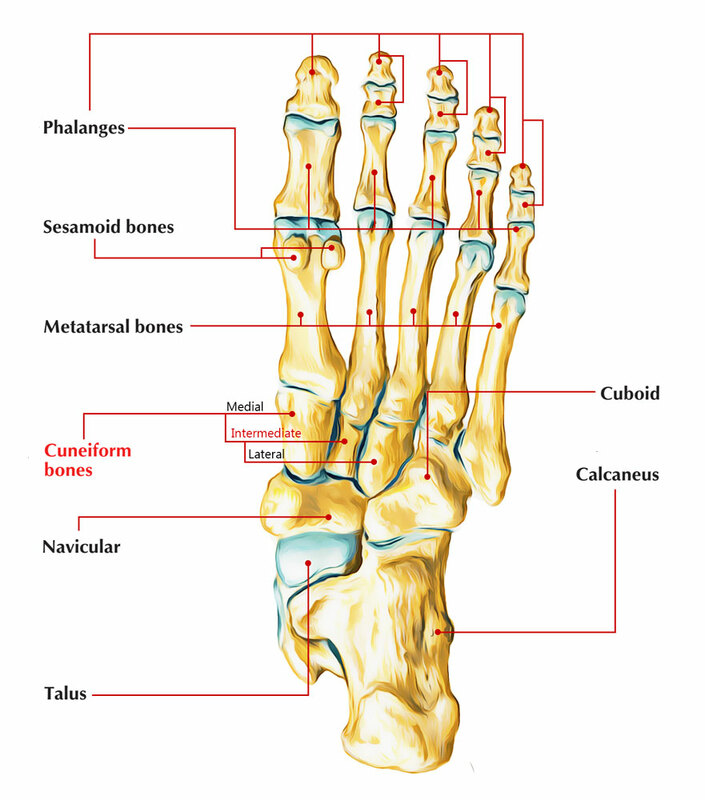 It joins with the foundation of the second metatarsal distally, the navicular proximally, the lateral cuneiform sideways along with the medial cuneiform medially. The intermediate cuneiform is the tiniest wedge shaped and also has a P-shaped side of the three cuneiform bones. They are the intermediate, lateral, and mediate cuneiforms. Dorsal side – The dorsal side is approximately square or broad at base and rough for ligamentous attachment. Plantar side – The plantar side merely gets a tendinous strip via the tibialis posterior muscle and is really narrow like a ridge. Proximal and distal sides – While the distal articular side is essentially planar, the proximal articular side has the tendency to be somewhat concavern. Both the distal and proximal sides are triangular with their bases along the dorsal side and a minor concavity dealing with laterally. Medial side: The medial side also has an L-shaped articular strip (which might be separated into two unique locations) along the proximal as well as dorsal margins, for joining with the medial cuneiform. The rest of the side is dedicated the connectment of the strong interosseous ligaments. Lateral side: It has a facet of its proximal margin for joining with the lateral cuneiform. It has a scooped L-shaped articular stripe around the proximal as well as dorsal borders; with the rest being unequal for connection of strong interosseous ligaments. The medial and lateral cuneiform create projection distally outside the intermediate, therefore creating a hollow for the base of the second metatarsal. The intermediate cuneiform is thus the only one of the three to join with a single metatarsal. A tendon slip of tibialis posterior connects to the plantar side. It begins with a center emerging at the 3rd year. This cuneiform is circullated by sections of dorsal arterial system to its dorsal, medial along with lateral sides. The intermediate cuneiform is stimulated by deep peroneal as well as medial plantar nerves, like the medial cuneiform.